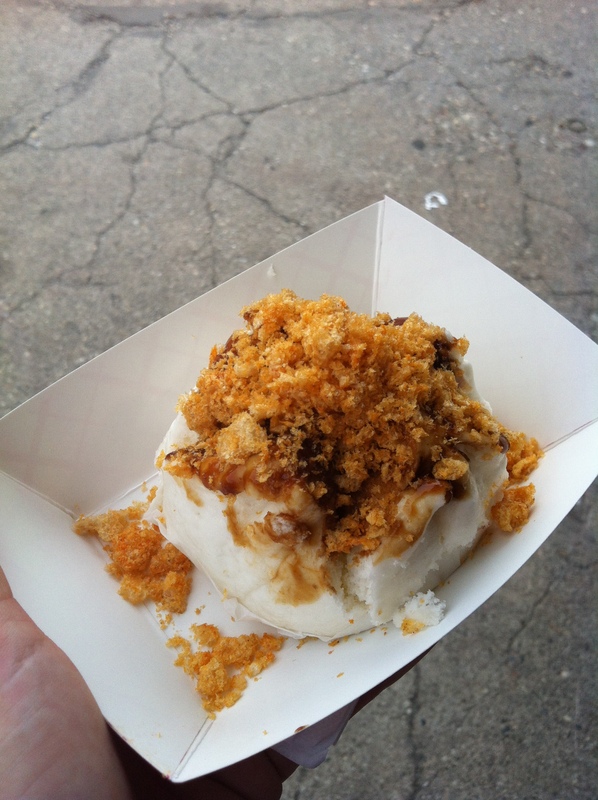 d.c. food rag | The fast-paced life of a food writer and professional cook. Last Thursday, I packed my knife bag and took off my chef’s coat for the last time. Yes, I’m officially finished with my longer-than-expected (but totally worth it) stint as a line cook. On August 1st, I will be starting a one-year fellowship with the editorial team at Oxmoor House, the book publishing division of Southern Progress. Specifically, I will be helping to write and edit cookbooks from Southern Living, Cooking Light, Weight Watchers and more. I couldn’t be more excited for this new adventure (and I hope Chef’s words will prove to be true!). For the past year and three months, I have worked as a line cook at Cashion’s Eat Place. During this time, my guiding philosophy was mis en place, or “everything in its place.” This is where Chef’s words about organization and efficiency come into play – you must not only make sure you have enough of every ingredient, you must place it in a location where it’s easy to grab or use during service. I’ve also learned that mistakes are okay, as long as you don’t make them again. Once, I spilled about five quarts of a sauce that takes several hours to prepare. And yes, it was right in front of chef, about thirty minutes before a busy dinner service. Needless to say, I have not spilled anything since that. Yes, working in a kitchen is a dirty job that is not all glamorous. Despite this, it can be extremely rewarding. I will miss working the grill on a busy, Saturday night. Oddly, it’s kind of fun to cook five steaks, four skin-on fish filets and three burgers all at once, kind of like an intense aerobic workout, actually. I will also miss hanging out with the cooks after service – we’d take shots of whiskey, play pool, drink beer, sometimes venture to this crazy Latino karaoke place and have pupusa, a kind of corn flatbread filled with cheese or beans. In many ways, it’s bittersweet, but it’s time to move forward with my food writing career. Who knows, though, maybe I’ll find myself back in the restaurant kitchen later on. So, as you have probably gathered, I will not be writing much about the D.C. food scene once I am in Birmingham. When I get settled, I would love to pursue freelancing in Birmingham – I have heard the city has a great food scene. Thank you to everyone who has read my D.C. blog over the past two years. I’m going to miss living in this incredible city, but it’s time for a new adventure! I finished my last night as a line cook two Thursdays ago. Naturally, the following morning I hopped on the Bolt Bus with Paul up to New York City for the weekend. City Bakery (Flatiron): My go-to spot for chocolate chip cookies. They are the best I’ve found in the city to date. It’s also a great lunch spot. 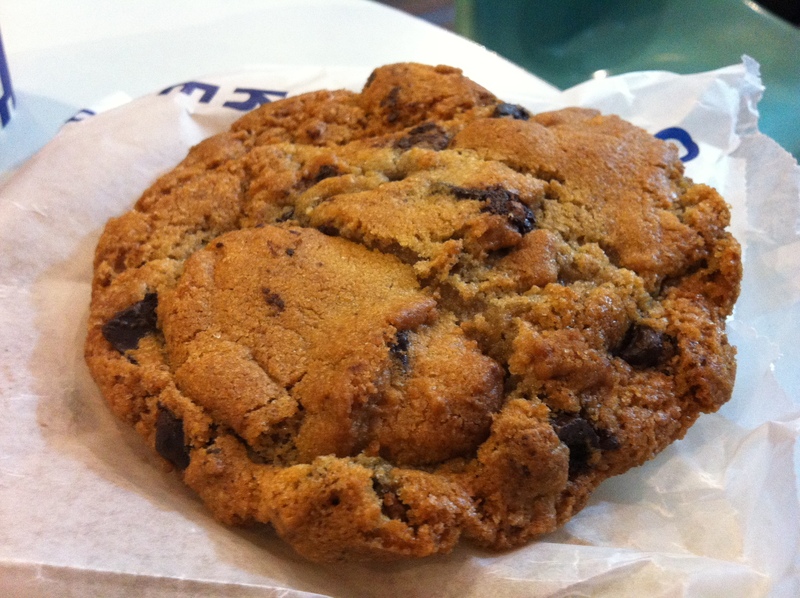 City Bakery’s chocolate chip cookie. Chocolate chip cookie: Mostly butter, absolutely divine and full of rich chocolate. Wasabi green pea-crusted tofu:Incredible texture and seasoning. Wow. Hot/cold drinking chocolate: These are individually packaged containers of hot or cold drinking chocolate, a speciality of City Bakery. Warm it up or, chill it or enjoy it room temperature. Treehaus (Midtown East): Quick, fresh food that tastes pretty good, too. I liked this spot because there are so many options, whether you’re there for breakfast, lunch and dinner. This was my choice for breakfast both days in the city (it was right next to our hotel). Blackberries, strawberries and mango: Fresh and perfectly ripe. These were a great topping for the Greek yogurt that I also bought. Egg White Omelette with Turkey Sausage, Arugula, White Cheddar Cheese and Tomatoes: Tasty and light, but also satisfying. Iced Coffee: So much better than the Pret-a-Manger lukewarm iced coffee I had earlier that day. 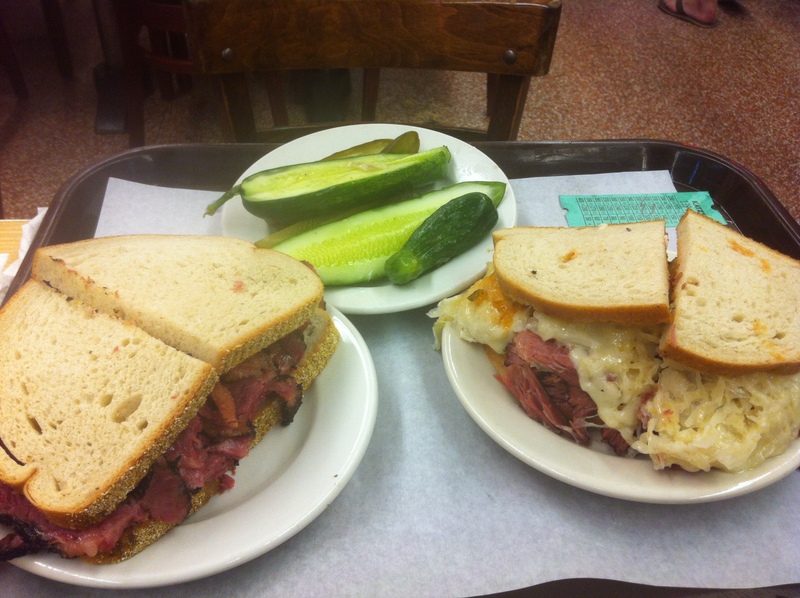 Katz’s Deli (Lower East Side): A famous New York Jewish deli, known for its gangantuan meaty sandwiches. Everyone, even vegetarians, should go at least once. 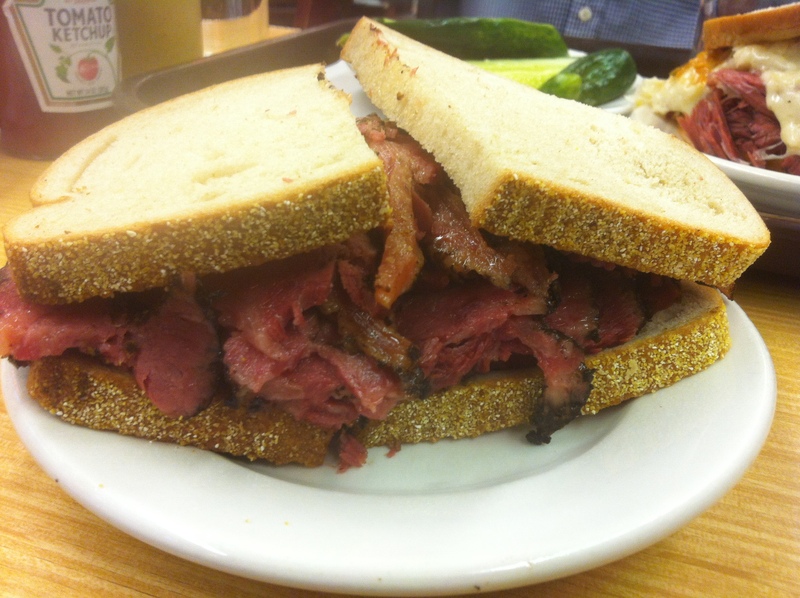 Pastrami – A meat monster, but an absolutely delicious one. The meat was moist, well brined and seasoned perfectly. It’s especially great with spicy brown Gulden’s mustard. Be prepared to feel full. Reuben – Another meat monster, but covered in sauerkraut and melted Swiss cheese. Messy. Pickle plate – Forget the fries, pickles are all you need. These deliver a much-needed burst of acidity that cuts the fat in Katz’s sandwiches. They also lend a nice crunch. Buttercup Bake Shop (Midtown East): A cute bakeshop worth a stop (if you’re in the area) for its attractive layer cakes and cupcakes. 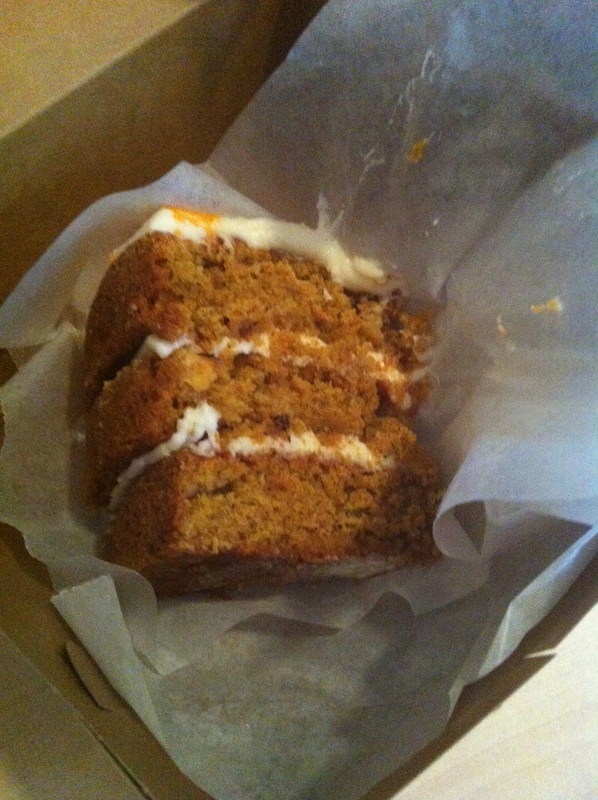 Carrot cake: The carrot cake really caught my eye. The slice was a generous size and the cake itself was moist and not too sweet. Just the way I like it. Peking duck with its traditional accompaniments. 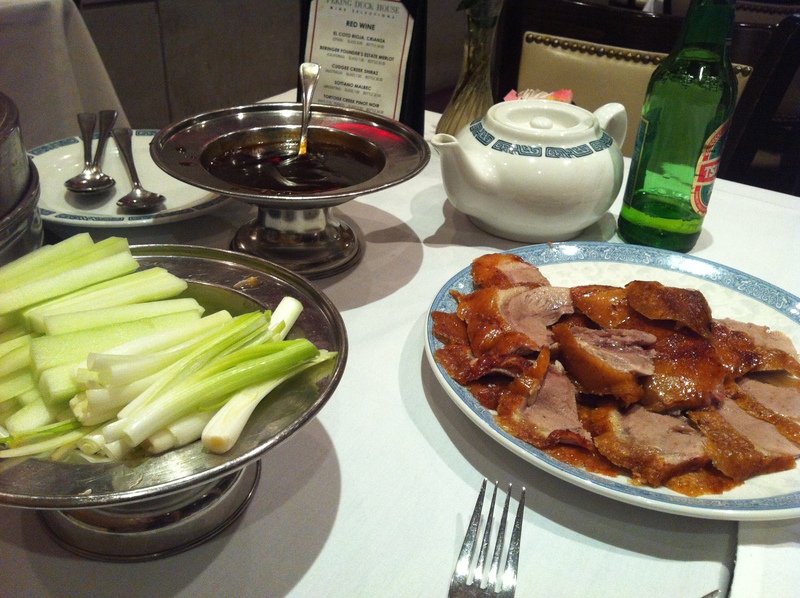 Peking duck – The duck arrives to your table whole, golden brown and crispy. Like some kind of theatrical performance, a chef butchers the duck right in front of you, presenting the table with a platter of sliced meat. To accompany are scallions, cucumbers, thin pancakes and hoisin sauce. It’s a simple dish to eat – spread hoisin sauce on one of the pancakes, top with a few slices of duck, one or two pieces of scallion, cucumber, wrap it up and enjoy. All in all, a lot of fun, and quite tasty, too. 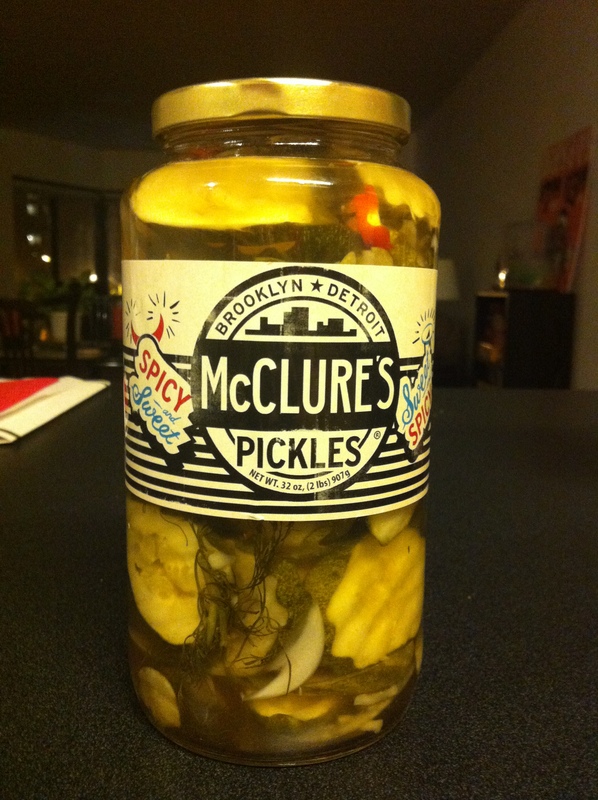 McClure’s Sweet and Spicy Pickles. 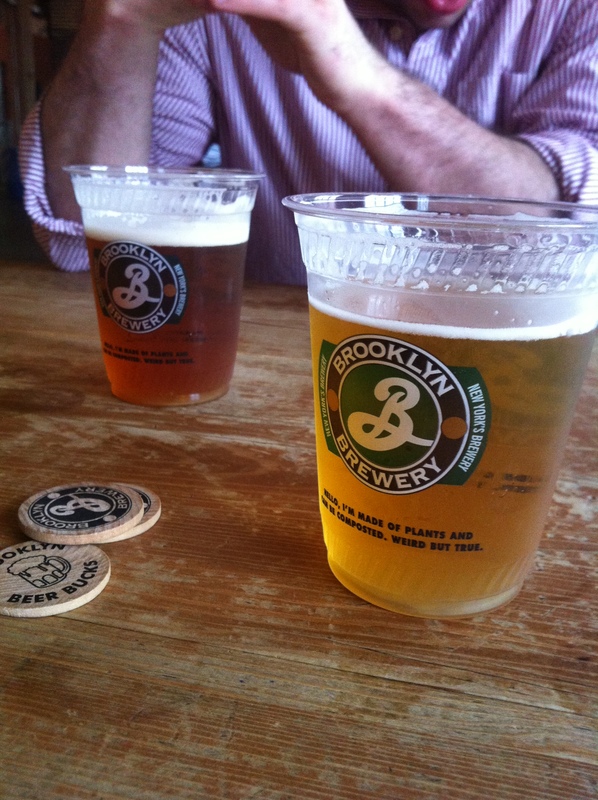 And last, but not least…The Brooklyn Brewery (Williamsburg, Brooklyn): This craft-brewery is a short walk from Smorgasburg. We hung out in the tasting room for a few hours, sampling the brewery’s beers. The laid-back atmosphere feels like an escape from frantic New York City life across the river in Manhattan. My favorite beer by far was the Brooklyner Weiss Beer, their version of a Hefeweissen. It ‘s everything a Hefeweissen should be, with light tones of banana and clove. 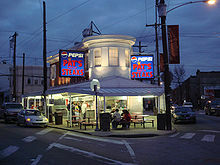 Pat’s, a South Philly landmark. When I was in college, my boyfriend Paul’s fraternity embarked on an epic quest to Philly each year. Around 10 p.m. on a Saturday, they’d pile into three or four cars and race up I-95 (I don’t even want to know how fast). Their destination? Pat’s King of Steaks in South Philly. The treasure? A cheesesteak “wit” onions and Whiz (Cheez-Whiz). When you order at Pat’s, you say “wit” to mean “with” and “wit-out” to mean “without.” Onions are fine, but Cheez-Whiz? Honestly? Thankfully they also have Provolone (although some will argue it’s not a cheesesteak without the Whiz). Travel to the intersection of 9th and Passyunk at around midnight on any given Saturday night and you will find a lively, if not peculiar scene. 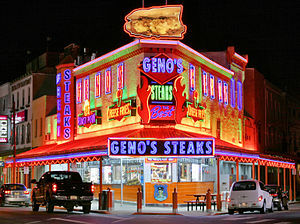 Across the street from modest Pat’s is flashier competitor Geno’s Steaks. The wild lights display, reminiscent of something you might see in Las Vegas, feels out of place in the middle-class South Philly neighborhood. I first visited Pat’s with my mom several years ago. I ordered a Provolone cheesesteak “wit-out.” The shaved ribeye, soft hoagie roll and slightly melted cheese on top was divine at the time, so I devoured the entire monster. 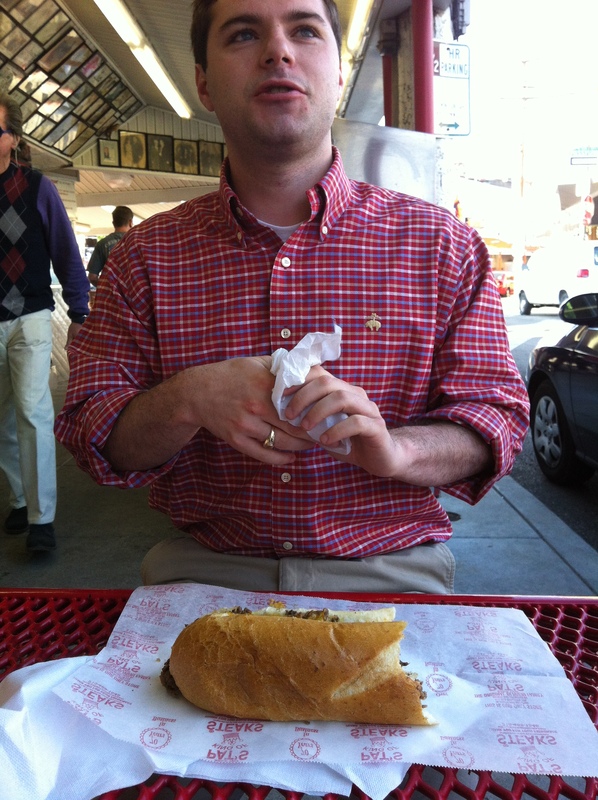 Paul, my boyfriend, had asked if I could bring back a cheesesteak for him in Baltimore. I can’t imagine anything is good after sitting in a car covered in Cheez-Whiz for several hours, but I’ve never seen him happier after eating his steak. Last year, Paul and I visited Pat’s late one Saturday night on our way home from a track meet in rural Pennsylvania. We drove 30 miles out of the way just to make a stop at Pat’s. We ate them inside my car because Pat’s only offers outdoor seating (In 30 degree January weather, that’s just not fun). For the rest of the drive back, the odd scent of Cheez-Whiz from Paul’s cheesesteak permeated my car. Most recently, I joined Paul on a road trip up to New Jersey for his summer job. I looked at a map beforehand and realized we would be passing Philly – obviously, this warranted a stop at Pat’s. Upon later inspection, I realized that Philly was a little out of the way, but of course I waited until afterwards to tell Paul this. Needless to say, he admitted it was probably the best detour he’d ever taken. Don’t take my photo while I’m chewing! Ask Philadelphians this question and they will probably direct you elsewhere in the city, such as John’s Roast Pork or Phillip’s Steaks. Yes, Pat’s and Geno’s can be touristy, but they are classic Philly landmarks. And if you live in D.C. like I do, you should visit them at least once. Sometimes, it’s more about what the place means to you personally. For Paul, visiting Pat’s reminds him of good times with his fraternity in college. For me, I think of the fun trip my mom and I took to the city years ago. For these reasons, we’ll keep going to Pat’s. 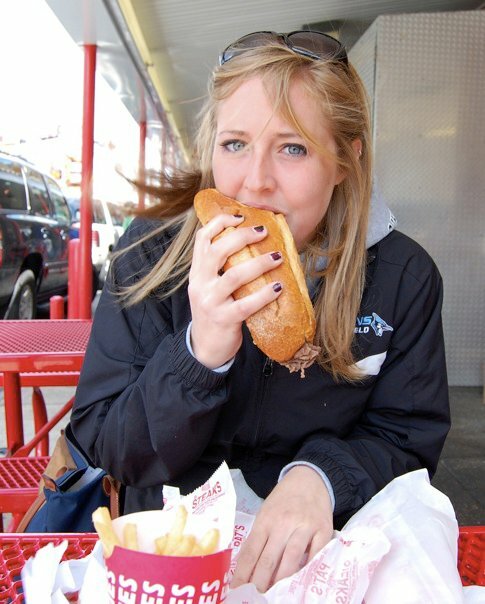 And, if we’re feeling extra adventurous, we might even try a cheesesteak at Geno’s. The grill. I’d feared it since I started as an extern at the restaurant where I currently work. The endless assault of steaks, burgers and other proteins struck every Friday and Saturday. I’d watched cooks fly finished plates off this station and I’d also watched cooks drown in the flood of orders. After working the salad station and the saute station (where I only cooked fish) for months, it was only a matter of time before I’d find myself here. Not the average backyard grill. About a month ago, it finally happened. I worried about my lack of previous experience. I remember one of the cooks (it might have even been the sous chef) telling me: “If you can cook fish, you can cook anything.” I’m not so sure this is entirely true. My father was territorial of our grill when I was younger (must be a man thing), so I’d always stayed away. We had touched on grilling briefly in culinary school, too, but we mostly stuck to sautéing, braising and baking. Oh well. I had to dive in at some point. Once I figured out how the heat was distributed across the grill, everything became easier. No, not all grills are created equal, and it’s important to understand this before you slap a piece of meat onto it. The hottest part of the grill is a perfect spot for quickly getting a dark, heavy sear on meat. The sear from the hot bars adds another depth of flavor and is one of the most important aspects of grilling. Sure, I burned off quite a bit of arm hair figuring this out, but at least my steaks looked nice. 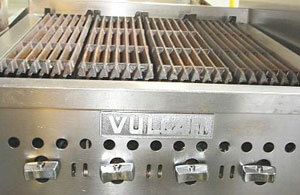 Surprisingly, I found working with a set of piping hot grill bars much preferable to using saute pans on the stove. Some dishes I’d made in the past on the saute station required three or more pans, which could quickly became a nightmare during a busy dinner service. With a limited amount of burners, I’d often run out of space for my pans. Forced to wait until a burner freed up felt like a death sentence at the time – anything that slows you down in the kitchen during a busy service is never, never good. Working the grill simplified everything. No pans, just bars and flames. After a solid month of working this station on busy nights, I’ve grilled a number of different meats and vegetables. Last week, it was brocoli rabe. This past week, it’s been grilled asparagus. Char from the grill brings life to the earthy, mild flavor of the asparagus. The ideal season for asparagus is anytime from February to June, with April being the peak. For seasonality’s sake, this recipe is definitely appropriate. Spring Valley Farm and Orchard, one of my favorite vendors at the Dupont Circle Farmers Market, recently featured some attractive-looking asparagus at their tent. Preheat grill, according to instructions (Like I said, not all grills are created equal!). Your grill should be very hot before you cook the asparagus. Snap off tough part of asparagus stems at the bottom. It should break off naturally with little effort. When grill is ready, brush olive oil over asparagus and season with salt and pepper. Place asparagus on a hot part of your grill. Use a set of tongs to roll the asparagus over once one side has a good amount of char, but not too much. Once both sides are nicely charred, move the asparagus to a less hot part of the grill to let them finish cooking. When cooked, the asparagus should be tender, but still have some crunch (Limp, wilted asparagus are overcooked). Let the asparagus cool and garnish with breadcrumbs, thinly shaved Parmesan or Maldon if preferred. Serve with a lemon wedge and enjoy! They’re delicious warm or at room temperature. Finally. 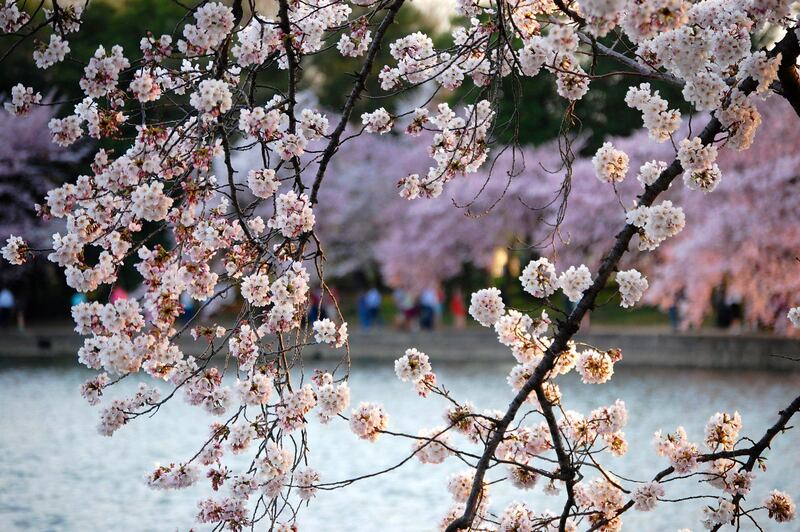 The Cherry Blossoms are almost at peak bloom! My mom, my roommate and I rushed down to the Tidal Basin yesterday evening to get a glimpse and snap a few photos. We brought a picnic dinner with us and enjoyed the view from underneath the outstretching branches of a cherry tree. Earlier in the day, I had a tough time deciding what to prepare. I wanted to avoid conventional picnic foods such as fried chicken, cole slaw and potato salad. Not to say there is anything wrong with these foods (I’m Southern, so you know I love fried chicken! ), but I wanted to try something different. I scanned Mark Bittman’s excellent piece, 101 20 Minute Dishes for Inspired Picnics, in the New York Times and found the perfect idea. Rice salad. Of course. They’re extremely versatile and pair wonderfully with lighter proteins such as chicken or fish. I crafted my own rice salad based partly on Mark Bittman’s ideas and from a similar recipe on the back of a bag of Lundberg Short Grain Brown Rice. Right away, I knew I wanted broccoli rabe and Kalamata olives in my rice salad. I love the complex, bitter flavors that broccoli rabe and olives can lend to any dish. In this recipe, they are well-balanced by the sweetness of the bell pepper and acidity of the lemon vinaigrette. With whole grains, nuts and greens, this salad is healthy addition to any picnic (we ate every bit of it!). Feel free to get creative and substitute different ingredients into the recipe as well. Oh, and for my fellow runners out there: this salad makes a great snack after an intense workout or long run. Enjoy with a glass of chocolate milk, of course. Prepare brown rice according to the instructions on the package, making sure to yield 3 cups cooked rice. Set aside and let cool completely. Lightly coat slivered almonds with olive oil and toast in oven at 350 degrees until light brown. Give the pan a good shake after a few minutes to make sure they toast evenly. Slice the stems off of the broccoli rabe, reserving the leaves. Take a handful of rabe leaves and roll them up on your cutting board. Slice thin and then rinse the leaves in a colander with water. Pat dry with paper towels. Heat olive oil over medium heat. Add the sliced rabe (it’s okay if it’s not completely dry) and sauté until the stems are tender. Season with salt and pepper. Place rabe on paper towels to drain excess liquid and let cool completely. Dice pepper into small cubes (They should not be much larger than the grains of cooked rice). Slice olives in half if they are small or quarters if they are larger. Pick mint leaves. Wash and dry with paper towels if necessary (sometimes they are clean). Lastly, make the vinaigrette by whisking olive oil into fresh lemon juice. Season to taste with salt and pepper. 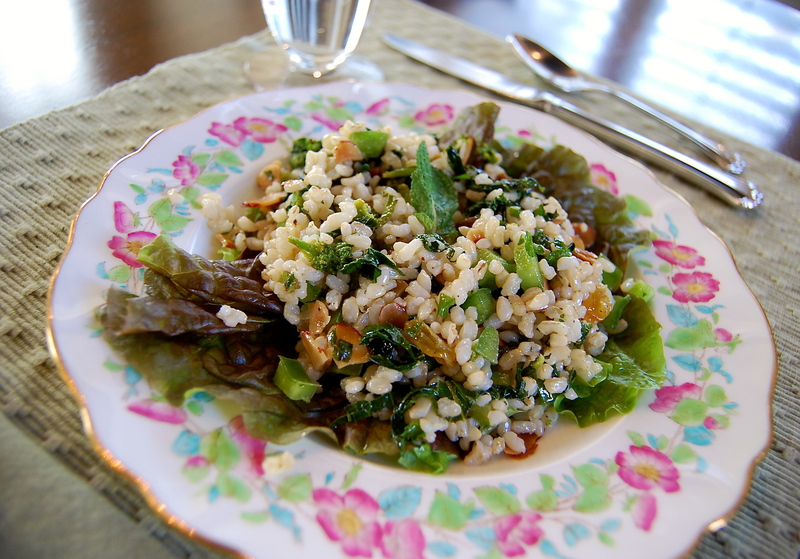 Combine cooked rice, toasted almonds, diced pepper, olives and broccoli rabe in a bowl. Chiffonade the mint leaves, or roll them up and slice thin. Add enough mint to the rice mixture so that you can taste it. Add lemon vinaigrette a little at a time and toss until the rice is well coated, but not drenched (You might not need to use all of the vinaigrette). Season the salad with salt and pepper and enjoy cold or at room temperature. Consider this scenario: You are in Parkville, Maryland, somewhere on East Joppa Road near the interchange of Loch Raven Road and I-695. You’re only 25 minutes north of Baltimore, but it seems farther. In front of you is an expansive asphalt desert, strewn with dotted lines and speeding cars. The area is industrial, with mostly furniture stores and car dealerships. You are stuck here for three hours without a car. What on Earth are you going to do? Don’t worry, there is a story behind all of this randomness. Last week, Paul needed car repairs at a Pep Boys in Parkville and we had to wait four hours until they finished. We made the best of a potentially irritating situation and explored the area. The verdict? There’s not much to look at around here, but you will find some killer good deals and prices. Would I ever come back here? Most likely no. So, without further ado, here are my highlights of East Joppa Road in Parkville, Maryland. If you ever find yourself in this area, you’ll be glad you read this. 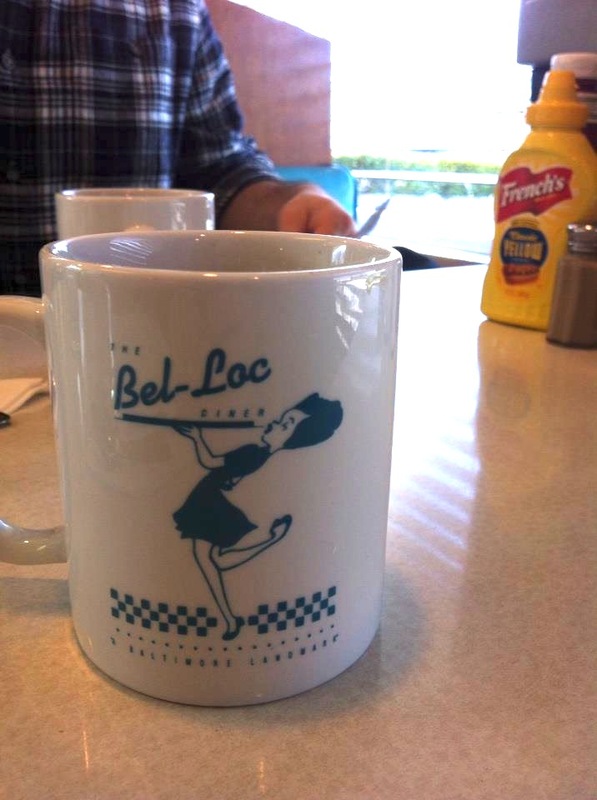 First opened in 1964, this blast-from-the-past diner is a rare find. Is it good? Well, no, not really. But for the authentic, diner experience, it’s worth a trip if you’re nearby. We ordered a Western Omelet, which was gigantic, and a two eggs any-style dish with bacon and breakfast potatoes. Our server was warm and friendly, and encouraged us to stay as long as we wanted while we sipped our coffee. You know what Goodwills are: a smorgasbord of random items at bargain prices. This is definitely one of the better ones I’ve visited. Similar to Bel-Loc, I felt like I’d stepped back 15 years in time. We found Disney VHS tapes, old records, books and retro gaming consoles. Paul found a cheap DVD he could resell on Amazon for a higher price and I picked up a milk frother for $10. (Now I can make lattes at home!) I looked up the actual retail price, and it was somewhere around $50. On Tuesdays, there is a 10% student discount. Oh, the things you do when you’re bored. I encountered all sorts of complicated-looking computer parts, but I also found odd items such as do-it-yourself potato clock. I wasn’t really sure what was going on here. It was mildly entertaining for about three minutes, and then I really, really wanted to leave. At least Paul, the computer genius, understood what was here. If you are in of need computer parts, then this is your spot. We had high hopes for this store. We imagined challenging games that required serious brain power. What we found instead was a children’s store with items like Play-Doh and multiplication flashcards. In fact, the entire store kind of smelled like Play-Doh. If you’re a teacher or a small child, then you’ll probably love this place. We spent 30 seconds here and bolted towards the crisp, fresh air. Once I saw how cheap everything was, I decided to knock out some grocery shopping. I bought three packs of Dentine Ice gum, a big-pack of fun size M&M’s, a pack of Rubbermaid tupperware containers, Palmolive soap, all for $1 each. You can’t even get these deals at Target! Obviously, there were some obscure brands that I might be skeptical to purchase, but overall there was a great selection of everyday stuff. This is definitely one of the best bang for your buck beer, wine and liquor stores in the area. When I went to Hopkins, we used to drive all the way out here to stock up before parties. I’m not kidding. This is probably the best chocolate milk I’ve ever had. 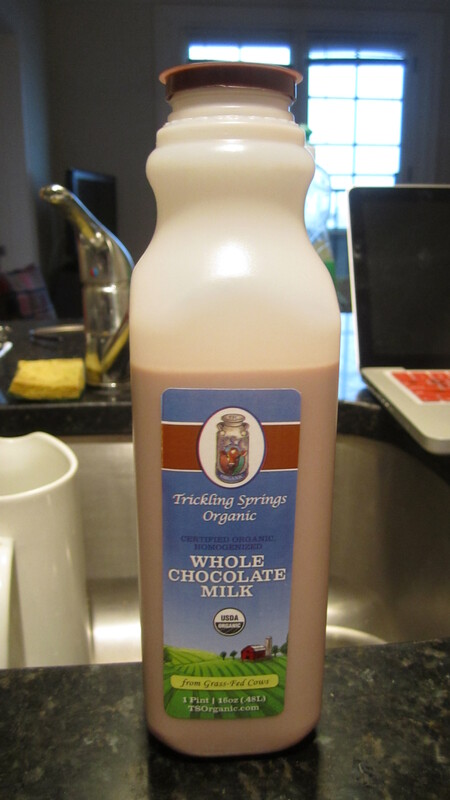 As a longtime Horizon Organic chocolate milk drinker, I was at first hesitant to put this in my shopping cart at the P Street Whole Foods last week. A rich chocolate flavor with a smooth, velvety finish make this milk shine. It’s a perfect match for chocolate chip cookies and just about anything, honestly. Trickling Springs Creamery, located in Chambersburg, Pennsylvania, buys their milk from small, local farmers who raise their cows with humane methods. This doesn’t necessarily mean organic, but the cows are pasture raised and grass fed. The creamery also uses a process called HTST (High Temperature Short Time) Pasteurization, which requires heating the milk to at least 160 F for at least 15 seconds to kill harmful bacteria. Typically, most of the milk you see on grocery store shelves is pasteurized using the UHT (Ultra High Temperature) method, with temperatures over 275 F. Trickling Spring’s low temperature pasteurization technique retains some of the milk’s original flavor and nutrients. Use this map to find Trickling Spring’s products near you. There’s a stand at Union Market that’s definitely worth a visit.